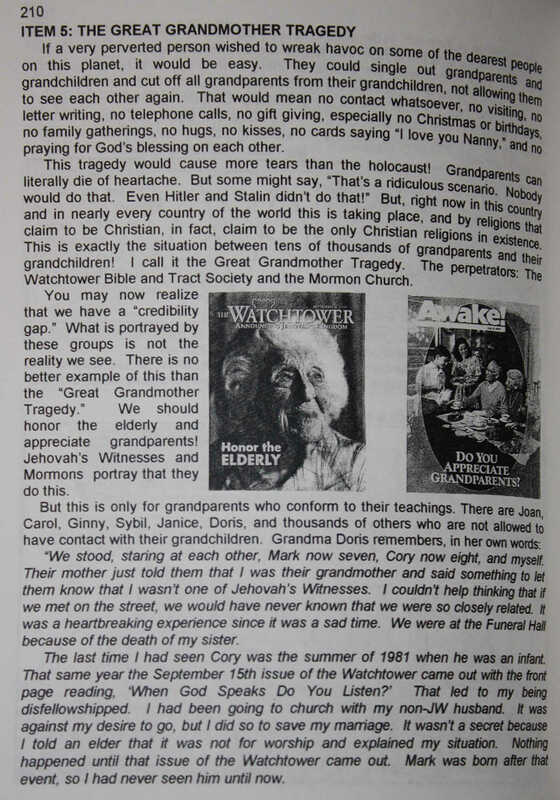 The video is based on a book that Daniel L. Hall wrote in 2000 called “The Armageddon Cult: Nothing in Watchtower is right!” It was recently recommended to me by two different friends, and I began an effort to obtain a copy. Unfortunately the only way to get a look at it is by contacting Mr. Hall directly, which I did. The book is out of print and the author is working on ways to get it back in circulation and available for order via Amazon. Anyway, I have enjoyed many sections of Mr Hall’s excellent and thoroughly researched book. I share a few pages with you now, entitled, “The Great Grandmother Tragedy”. NOTE: Due to the many people asking me if I am on Twitter, now I am. 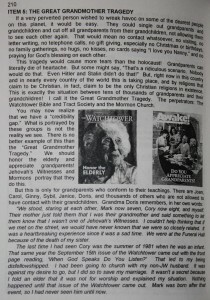 Follow me at @JWStruggle for more breaking news in the twisted world of Watchtower! Where is it going, never saw this in my day [nearly 20 yrs ago]? This scripturally would disinfranchise Elders and MS of thier positions: 1Timothy 3 v 4,5 & 7. Such bring Christianity into reproach. Yes how true! They don’t care about you or your health if you aint at the meetings your dead! I know Brothers who died in the KH and they were praised as “such Spiritual ones” because they died in the Hall. Such weird unbalanced mentality. One of my close friends within ‘the organization’ just watched his mother die. The elders literally made it known that no one was to provide her help during her cancer treatments because her ‘fiance’ was visiting the house and giving making her food, making sure she took her medication, etc…..alone, without a chaperone. Maybe what I want to tell is not entirely related to this topic but I was just reminded of something a friend of mine told me (she is beginning to see the ‘problems’ around the Society). Her Dad passed away 2 years ago and she now told me that when she told one elder at that time how devastated she felt the elder said pointing to another brother: Look at him, he lost his Mom just a few days ago, can you see sadness in his face? (or something else to this effect). Of course I’m sure the brother felt grief at the death of his mother, still, he felt it his duty or ‘the right thing’ to hide it lest the others should think his trust in the Paradise was not strong enough. I was really shocked at this and the behaviour of the elder, who found this a good example is even more shocking. There is a post on my main page about Divisions. My daughter still will not talk to me or my wife. At John 16:2 They imagine that they are doing a sacred duty for God, by throwing you out. My latest article is Armageddon. May the God of peace comfort us all. Being disfellowshiped from a Christian congregation for speaking what Biblically seems irrefutable, and for worshiping in spirit and the truth, something you say we should never be deterred from…. Hey, would you disbar someone , say on this site who is trying to show what the scriptures really say is truth? What if they are strong in their conviction? Is this intolerable? Do you believe in shunning persons off this site? What would be the reason for this? Isn’t this like the JW action , bias, and petty? Would a vote be taken? Like in the first-century? “If he does not listen to the congregation….”? Or does it come down to the bias of certain moderators chosen, and disagreement with their views. Is there a ‘re-instatement’ process one can go through… kind of like a ‘buttering-up’ process? How did you define those ex-communicated from association here with others who really are searching for TTATT? I noticed Brother Spike, a lowly and humble brother who struggles with still being inside JW ‘land’ asked how some felt about me, although I was kicked off this site a year ago. Mainly for my teaching the Truth about scriptural truth…primarily word for word the book of John. Sister Little Lamb got on and gave a vitrolic response; tough and hard-hitting. What could be expected but that? She was my ‘back’ throughout her tenure here. She spoke what she thought deserved to be said. Now that the trinity doctrine has been effectively squashed, will you please reconsider my re-instatement to comment on the forum? As you know, I dedicated thousands of hours building a body of scriptural truth on your site, and I don’t deserve to be dismissed as the 8th grader who spoke his mind, but as equitable to any and all ‘superfine Apostles’ posting here. If you really do, honestly love the truth…I ask to be able to post again in defense of, and love of the truth about JEHOVAH, Christ Jesus, and the Kingdom Godd News. I vow to be polite, equitable, and patient in my remarks, and apologize for overreaching my position as a humble Christian disciple, and granted mercy for all my sins, rather than self-righteous as many tagged me. It’s good to hear from you John! The Forum is a different place than out here on the blog. Let me look into that and perhaps we can email okay? As for here well I’ve never “DFed” anyone and I never will, as that has to do with shunning a person and condemning them. Even if I disagree with a person’s theology that would never make me hate them or shun them. If someone is violating the site rules or coming on here annoying the others and I receive complaints then that is a different story. This is just one blog out of thousands, and not a congregation nor an organization. There are no creeds nor requirements demanded of anyone. Lately JW Militants have been coming on here and especially on my YouTube channel more and more, and sometimes they just insult and call names right off the bat. If it was your site or channel what would you do? I for one feel that life is too short to worry about negative people like that and I’m inclined to just let them go debate somewhere else. Fantastic quote. I wonder how often the opposite is true, i.e., do evil people perform good works to alleviate religious guilt with notable regularity? Hmm. Woe to us who suffer the human condition! miscreant droid l loved what you said that most of us live clean spiritual lives. It’s so true some of us are! How could we turn our backs on truth? Listening to The voice of our King of Kings and Lord of Lords. “Learning more than we have ever learnt in our entire lives. Because we left a man made organization does not mean we have left Father in heaven. “That’s well describes just how l felt as well Rapunzel. Our loving heavenly father told us in John 4:21-23 about the woman at the well. This next part is for us to follow. Yeshua said to her: Believe me woman, the hour is coming when neither in this mountain or in Jerusalem will you people worship the Father. Yeshua makes its clear salvation originated with the Jews. “Sunset, Its so sad to say but even J/Ws have taken this from our Messiah and made him look like a western man even in there books. ‘ But getting back to what l was saying in John4. Yeshua made it so clear when he said. “You worship what you do not know! We worship what we know. Nevertheless the hour is coming AND IT IS NOW! 1st century this started. “That they truth seekers would worship in Spirit and truth. Father is a Spirit! “Indeed the Father is looking for such ones. We do not have to go through organizations. “Religions anymore. Because from now on the Holy Spirit is teaching us all. I couldn’t disagree more with adding Mormons to the list(s) of religious groups that actively shun. I lived in Utah as a kid and later in Colorado, California and Arizona where there were larger numbers of LDS. I never saw it, in families where some members were in other churches or in a few examples where someone was ex’ed, I never saw exclusion, or even trash talking. I don’t think they kick many out, those who leave likely discovery things they were never told before and just can’t deal with the hushed up history. I know they are big on getting involved with communities, working with other churches to help out homeless folks and to give aid to disaster areas, so they certainly don’t look down on those with differing beliefs or keep separate, try to control what members read or see, who they socialize with etc. People since the beginning of time have been revising their history. When a person in favor with the king lost his status or went rogue, his name never spoken again. If his likeness or name was carved into the walls, the walls were destroyed or erased. Officially, he never existed. A number of books have been written about this, with 1984 by George Orwell being among the most famous. Fahrenheit 451 by Ray Bradbury is another great book that is ironically about the banning of books. It was itself a banned book for many years and may still be in certain places of the world. How Many are/were Elders and Ministerial Servants? I have been receiving a number of emails and contacts from brothers that are currently serving in the congregation. Also several that have stepped down, not for “wrong doing” but because their conscience does not allow them to continue to teach things that they have found are untrue. The excerpts below are from a variety of these communications.